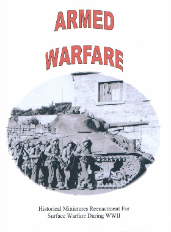 ARMED WARFARE covers all aspect of surface warfare during the WWII era. Armor, infantry, mines, artillery - on and off board - aerial interdiction, amphibious landings, open and urban terrain. The size of the arena can be any size players desire, 2'x2' with a few men to 4'x8' with lots of men and/or tanks. Shooting ranges extend out to eight feet. The rules are based on - What you see is what you get. One on one. Info is provided for almost every vehicle and general type of small arms from 1936 to 1954. All scales can use the rules: micro to 1/35th. Large number of vehicles will use the main rules and the few specially for that scale. 15mm to 1/35 will probably be infantry combat with a few supporting vehicles. These will use the main rules, the few rules for the large figures and the matrix for receiving wounds. The matrix is designed so a man might be hit, wound and live to fight some more. The last part would be at a reduced ability. A man hit in the left arm can still shot a pistol with his right hand. Deluxe download version. The rules with all the photos and the article on Rules For Warfare. 35 sheets includes 211 different cards for vehicle, infantry and terrain cards. The eight countries covered include Japan and Poland. 6 sheets of Event cards are provided. The Event cards are drawn each turn. They provide unexpected twists to the game. The vehicle and infantry cards are excellent for hidden movement! Turn the cards over and move them about. Your opponent has to guess if they're fake or real infantry or armor. The cards can be used by them selves if storage is limited or for hidden movement markers for real models. Since almost every type of vehicle is included there is no changing of what was intended. If a Mk II is turned over the owner can't say it's a Tiger.